I have another new project in the pipeline. A personal project where I want to perfect some techniques of mine. Mainly in creating lots of details in the models while keeping the polygons to a very low amount. But also to some extent texture painting. So here is the first quick draft of a character called The Innkeeper. This is mostly a rough draft of this character. I’ve modeled the actual body and head in LightWave to get the overall look and proportions where I want them, as well as blocking in his clothing. His robe is where I have started doing some more work. I have got quite some details modeled into the robe, while still maintaining a very low polygon count, so I am relying on a very nice topology carefully placed where needed for the details while still having good edgeloops so it’s animation friendly. 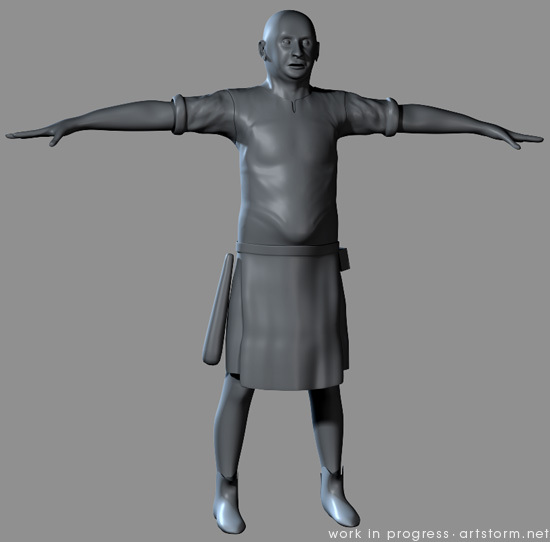 I am using ZBrush to sketch out the details I want in his clothing to then bring the model into Modo to redo the topology exactly how I want it. Retopologizing can be a pain, but I find Modo’s tools quite quick and intuitive for this kind of work. I’ll continue modeling this guy all day, so a new post will follow shortly with more details.